This workshop was held in 2017 and this information is presented for reference purposes only. Healing means that trauma no longer controls your life. This two-day training offers a practical “hands on” approach when working with clients with underlying issues of self-alienation and self-hatred. Learn to help recognize how trauma leaves them fragmented and at war within their own minds and bodies and offer proven treatment techniques for resolution. Childhood abuse requires self-alienation: we must disown that humiliating “bad child” and work harder to be the “good child” acceptable to our attachment figures. In the end, we survive trauma at the cost of disowning and dissociating from our most wounded selves. While longing to be feel safe and welcome, traumatized individuals find themselves in conflict: alternating between clinging and pushing others away, self-hatred and hostility toward others, yearning to be seen yet yearning to be invisible. Years later, these clients present in therapy with symptoms of anxiety, depression, low self-esteem, diagnoses of bipolar and Borderline Personality Disorder, and a distorted or absent sense of identity. This workshop offers a practical “hands on” approach to clients with underlying issues of self-alienation and self-hatred by helping them to recognize how trauma leaves them fragmented and at war within their own minds and bodies. Traumatized individuals must be taught to observe both the parts they have embraced and identified with as ‘me’ and the trauma-related parts they have disowned and judged harshly. Using interventions drawn from a number of therapeutic approaches (including Sensorimotor Psychotherapy, Internal Family Systems, and ego state therapy), the focus is on helping clients observe and accept all aspects of self with mindfulness-based interest and curiosity. As these young parts are identified and understood as ‘heros’ in the individual’s story of survival, clients are able to feel more warmly toward them, often for the first time. Techniques will be demonstrated that increase the capacity to feel for and with each part, that foster the sense of caring for young wounded parts, paving the way for growing “earned secure attachment” or attachment to ourselves. Even when they are unable to tolerate emotion, forgive themselves, or take in someone’s caring for them, our clients can learn to feel pain and affection on behalf of their younger selves and even learn to welcome these ‘lost souls’ with warmth and self-compassion. 9:00am — 10:30am Alienation from Self as a Survival Strategy in the Context of Abuse, Neglect, and Attachment Failure. 11:00am – 12:30pm Fragmentation and Splitting as an Adaptation to Trauma: the Structural Dissociation model. How ‘keeping on’ in spite of the trauma exacerbates internal struggles and hostility. 1:30pm – 3:00pm Mindfulness-based and somatic techniques for ‘befriending’ fragmented, dis-owned parts of the personality, regulating the nervous system, and reducing chaos and crisis. 3:30pm—4:30pm Skills Practice, video-taped session excerpts, case presentations and questions. 9:00am – 10:30am Developing attunement and empathy for one’s traumatized parts: increasing ability to appreciate the role of each part in survival, developing internal dialogue skills. 11:00am – 12:30pm Using internal dialogue to provide wounded child parts with the “missing experiences” once longed for. 1:30pm – 3:00pm Learning to connect emotionally and somatically to a felt sense of the young child, communicating emotionally and somatically. Janina Fisher, Ph.D. is a licensed Clinical Psychologist and Instructor at the Trauma Center, an outpatient clinic and research center founded by Bessel van der Kolk. Known for her expertise as both a clinician and consultant, she is also past president of the New England Society for the Treatment of Trauma and Dissociation, an EMDR International Association Credit Provider, a faculty member of the Sensorimotor Psychotherapy Institute, and a former Instructor, Harvard Medical School. Dr. Fisher has been an invited speaker at the Cape Cod Institute, Harvard Medical School Conference on Women, Summer and Winter Conference Series, EMDR International Association Annual Conference, University of Oslo, University of Wisconsin, the University of Westminster in London, the Psychotraumatology Institute of Europe, and the Esalen Institute. Dr. Fisher lectures and teaches nationally and internationally on topics related to the integration of the neurobiological research and newer trauma treatment paradigms into traditional therapeutic modalities. Please contact us via our contact form here, selecting the “Workshop” => “Janina Fisher 2017” option and we’ll get back to you as soon as possible. This magnificent book is the last word on the ‘somatic narrative’ ― the nonverbal language of gestures, postures, and facial expressions that reflect the inner maps that determine our orientation to our surroundings. Pat Ogden (& Janina Fisher) brilliantly explore how our fundamental engagement to the world is not primarily expressed in words or concepts, but by the way we habitually move and connect. Profound in its fundamental insights, thorough in its scientific underpinnings, and practical in its applications, this eminently accessible book promises to be the preeminent guide for therapists and patients alike to explore and transform persistent maladaptive behavior patterns. 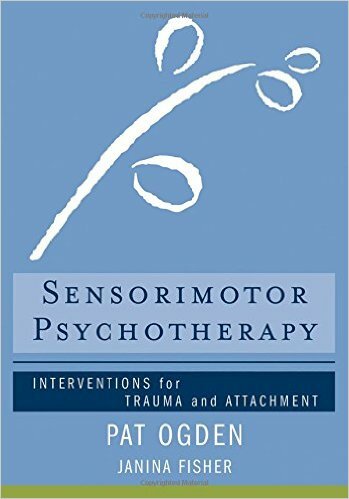 I hope that every therapy training program will put Sensorimotor Psychotherapy near the top of its required reading list. Sensorimotor Psychotherapy is a landmark book in the history of body psychotherapy and effectively provides the bridge between traditional psychotherapy and body-oriented therapies. In this discipline-changing volume, Pat Ogden (& Janina Fisher) brilliantly decode the crucial role that the body plays in regulating physiological, behavioral, and mental states. The book provides an accessible tutorial that will enable the reader to understand the voice and vocabulary of the body. We learn that even when the spoken word fails the body dynamically communicates in a complex social world through gestures, postures, facial expressions, and vocalisations. Sensorimotor Psychotherapy equips the reader, whether clinician or client, with the tools necessary to link the intuitions of the body and the words of the personal narrative. I’ve had the good fortune to have been taught by or worked alongside the giants in the field of psychological trauma: first, Judith Herman, then Bessel van der Kolk, and, most recently, Pat Ogden. And as much as these pioneers taught me, the most powerful and gifted teachers I have are my patients. These survivors have given me a window into the inner experience of the legacy of trauma, taught me what always to say and what never to say, helped to validate or disprove what the experts and theorists were claiming. It has been a privilege to learn with them and from them. We now understand that trauma’s imprint is both psychological and somatic: long after the events are over, the body continues to respond as if danger were everpresent. My professional mission has been to bring this understanding of trauma to both clients and their therapists as a psychotherapist, consultant, and trainer of clinicians looking for answers to helping their traumatized clients. I believe the key to healing is not just knowing what happened but transforming how the mind, body, and soul still remember it.